As you well know, with homeschooling comes learning materials and supplies living in your house. Some homeschoolers have a limited number of materials and supplies while others of us have a lot. And whichever category you fall into, those materials and supplies can begin to take over your whole house, especially when they start multiplying like little Gremlins. So, what are we going to do about it? Because with all of that stuff comes an uncomfortable feeling of chaos. In order to gain some peace and calm we have to take control over those multiplying Gremlins! And that means we need to declutter. Thankfully, in 5 simple steps we can get it all under control! But here’s the catch. (There’s always a catch, isn’t there?) While these steps might be “simple” some of them can take a lot of time. Especially if there is a lot of decluttering to do. So, while it isn’t as simple at that word “simple” implies, it is absolutely possible. Be encouraged and know that if you set aside some designated time to work through this, you can make big strides. 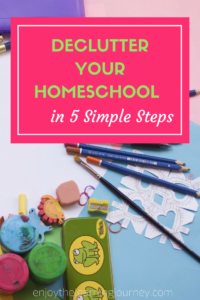 And you’ll be in a much better position to get your homeschool organized and to then sustain it without a big commitment of time moving forward. If you are anything like me then you have a ton of ideas and to-do’s swirling around in your head 24-7. And even if you aren’t anything like me, you probably still have a lot of thoughts and ideas going on in that brilliant mind of yours. When you get those thoughts out of your head and onto a piece of paper, you’ll be able to look at it in plain black and white (or maybe not black but a pretty pink color from that new gel pen you just got) 🙂 and then decide what’s important and what’s not. I know that for me, when I keep that all in my head I experience overwhelm, anxiety and I don’t even know where to start. In order to combat that I am constantly writing things down. It’s my way of getting from disorganized to organized. So, if you have a lot of thoughts going on, whether it’s related to this declutter project, homeschooling or life in general, just start putting it all on paper. You’ll then be able to analyze it and put it into a more organized plan. In turn, you’ll begin to feel more calm and less scattered. 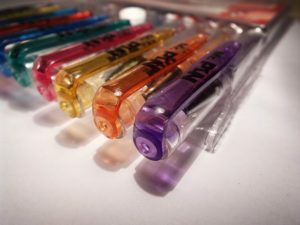 It might just develop into a habit and as an added bonus you can use all those pretty colored pens in the process. 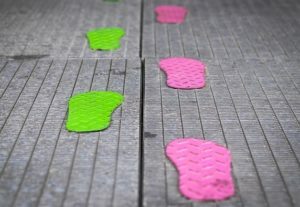 This can be a huge undertaking and broken down into anywhere from 10 to 1,000 steps. I fully recognize that decluttering your home can take a long time as you go from room to room and decide which items can be thrown away, donated or stored. But that’s not my purpose here. I am suggesting you look at some of the larger items and main areas of your home. If you want to do a full declutter than you’ll want to check out this plan. It’s a great thing to do if you have the time and energy. But if you don’t, you’ll want to at least do a sweep of your house and clear out any obvious items. It always feels good to open up a little more space! Get rid of the books, supplies, and materials that you no longer use or need. You can pass it on to another homeschooler or sell it. You can sell on eBay, through a Facebook group designed for that purpose, Craigslist, as well as other places. If you don’t need it now but are pretty sure you’ll need it later then move it to a storage area in your house. Next, box up all the paperwork and art projects or throw them away. Remember it’s ok if you don’t keep everything. Just keep the things that you need (as required by your state) and those that are nice keepsakes. Whether you want to include your children in this process or not is up to you. I’ve done it both ways and it’s definitely much easier for me to do it myself but they need to learn how to determine what to keep and what to let go so I do include them sometimes. Or I’ll make a small pile of paperwork that they can go through and I go through the rest. When I do it on my own, 99% of what I do throw away is never asked for or remembered. That 1% will come back and get you though….”Mom, where is that bear project I made? ?” Oh, ummm….let me think…oops! I have a lot of work to do with this one so you might need to give me some tips on this but one thing I’ve learned over the past several years is to stop downloading all the free printables. They are wonderful. They are amazing. I use them personally and for my homeschool but I don’t need them all. If this is something you struggle with too (because they are free and you might just need them), I’d suggest one thing. Before you download anything, think through if you are really going to use it. And then take that one step further and decide if you’ll use it within the next week (or month or whatever timeframe you choose). If not, then hold off. 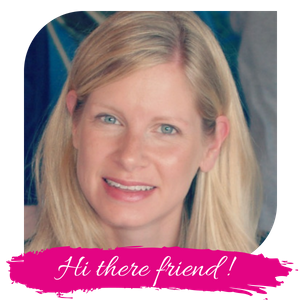 Just download the printables that will be most helpful and can be used in the very near future. For for those file that you decide to download, remove them from your computer once you are done with them. If you aren’t going to use it again then you don’t need to keep it on your computer. Think of it just the same as you do for physical items in your homeschool space. If you have a lot of homeschool files on your computer that you don’t use and are taking up space, then now is a good time to set aside some time and go through those in order to clean up your computer folders. This takes time and reflection (and prayer) as you determine any outside activities or inside activities that just aren’t as meaningful or necessary as some of the other things you are doing. But go ahead and remove anything that’s not as important to you because the more free your schedule is, the more free (and less stressed) you will feel. 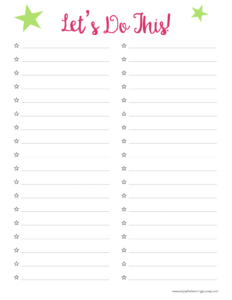 For a free pretty printable to help you on your decluttering mission, be sure to sign up below for access to my printables library! To start at the beginning of the Homeschool Organization series, head on over to the first post. 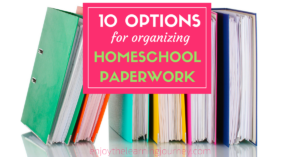 Or head on over to the next post in the series, 10 Options for Organizing Homeschool Paperwork.